* You have an old toilet with a large 20 liter / 5 gallon tank. These haven't been sold in years. Newer tanks are typically 13 liter or less, and more importantly, the liters per flush droops to 13 LPF (3 GPF) for toilets currently available for purchase, and in some jurisdictions, new houses must have even more efficient 6LPF or 1.6GPF toilets installed. * You have the wrong type of flapper installed in a 6 liter per flush toilet. This can use upwards of 15 liters per flush or 4.4 gallons. But even if you only save half or a quarter that much - and even if you don't pay for water - you'll still save money by installing a HydroRight dual flush converter. The HydroRight dual flush converter quickly and easily converts standard toilets into two-button toilets that feature a Quick Flush for liquids and paper and a Full Flush for solids. It has been proven in independent tests to reduce indoor water use by 30%, even in low-flow, 1.6gpf toilets. The HydroRight requires no tools or tank removal to install. 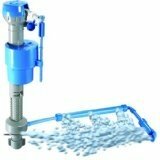 For the best results for the HydroRight dual flush converter kit, we recommend the Hydro Clean Fill valve. 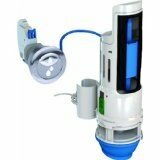 It controls the water fill for your toilet and works great with the HydroRight dual flush converter kit.